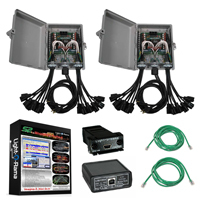 Our Basic Getting Started Packages include everything needed to setup a musical light show! Note: Requires a computer with an availble USB port, extension cords, lights, and outdoor speakers/FM transmitter for sound. Package does not include sequences, which can be created with the included software. We also have sequences available for Christmas, Halloween, Lightning, 4th of July, and Bust Layouts. Also available in 16 outputs, 48 outputs, 64 outputs, and 128 outputs.